If you are looking into getting an IP camera system for your home or office, you must have come across the term PoE. What does PoE mean? Is it worth paying for? What are the alternatives? Can you use PoE for your existing IP cameras? These are some of the questions I often get from our readers, so I thought I would write a post dedicated to all things PoE. What is the difference between Active and Passive PoE? How does Power over Ethernet work? What voltage is Power over Ethernet? What are the advantages of using Power over Ethernet (PoE)? How to connect an IP camera using PoE? How far can you run a PoE camera? Can I use PoE for my existing IP cameras? Which camera manufacturers support PoE? Power over Ethernet or PoE for short, is a technology that lets you transmit power and data over a single Ethernet cable, without any negative effect on data speeds. Active PoE is where both the PoE power source and the PoE powered device are standards-compliant and talk to each other to negotiate the exact amount of power needed. If a device claims that it is PoE standards compliant to, say IEEE 802.3af, it is claiming that it is an active PoE device. In contrast, you can piggy-back power over an Ethernet cable using a PoE injector and this is called passive PoE. The injector simply takes the power you provide and transmits it to the other end of the Ethernet cable in a dumb or passive fashion. A typical Ethernet cable consists of 4 twisted pairs of 8 copper cables. Depending on the speed of data transmission (10/100 Mbps or Gigabit Ethernet), some or all of these pairs are used for sending and receiving data. These same copper pairs can also be used to send electricity. Which pairs exactly are used for sending power depends on the type of PoE (Active or Passive) and the specific PoE standard used. When a PoE camera is connected to a PoE power source, the PoE power source will go through a multi-step process to discover and negotiate the required power level of a PoE powered device. Using a method called signature detection and classification, the PoE power source will start off with a low voltage and will raise the voltage until it meets the requirements of the powered device. It will then continue to monitor the power consumption of the device and accommodate any fluctuations. The IEEE 802.3af standard is the most common type of PoE you will find. This standard provides for up to 15.4W of DC power per PoE port, that is a minimum of 44 V DC and 350 mA current on each port (Power = Voltage x Current). Due to voltage losses however only 12.95W is assured per port. Most PoE switches output up to 48V. Most fixed lens cameras use around 7 W power only, so 802.3af compliance is plenty. However for motorised cameras the power requirements can easily go into the 20 W range, for example the Reolink RLC-423 PTZ requires 22 W power. This is why the 802.3at standard called PoE+ (or PoE Plus) was created which provides up to 25.5 W of power per port. There are two newer standards that aim to increase the power available per PoE port, 802.3bt Type 3 (max. 51 W) and 802.3bt Type 4 (max. 71 W). I haven’t seen devices that support these standards yet. Typically the voltage used by PoE is 48 V. Copper wires are not just electricity conductors but have electrical resistance as well. This resistance causes some of the energy it conducts to be lost as heat and causes voltage drops. So the voltage at the PoE power source is higher (in the 44-57 V range) than the voltage at the powered device (37-57 V, depending on the PoE standard used). A lower voltage device like a camera that needs only 12 V will then step down this voltage internally before it is used by the camera. The reason for the higher transmission voltage is that voltage losses are lower at higher voltages, which is also the reason that power companies transmit electricity across large distances at very high voltages of up to 765 kV even though domestic power supply may be only 110/230/440 V.
Flexibility and lower installation costs – PoE removes the need of having an electrical power outlet at the camera installation location. Also you don’t need to run separate power cables to each camera installation location. 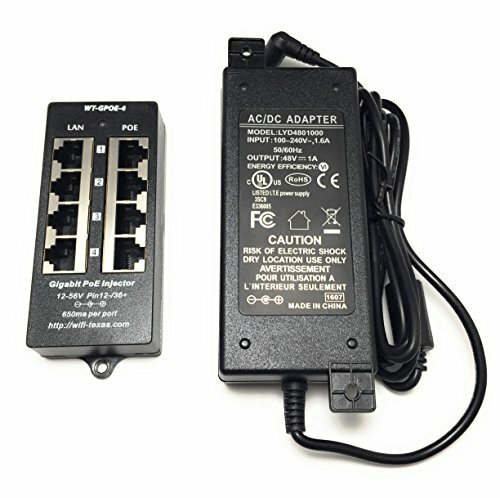 A standards-compliant PoE switch can discover and auto-negotiate power requirements for each device that is connected to it. This means you do not have to figure out how much voltage or power to provide to your devices, as long as the power requirements are lower than the rate output of each PoE port on the switch you are fine. Voltage losses over long Ethernet runs are automatically adjusted for by the PoE auto-power negotiation process. PoE provides overload protection as it constantly monitors the power requirement of a device and can adjust it as required. Centralised power management and troubleshooting becomes possible because you can monitor the power usage of each device through a smart PoE network switch. Centralised power backup – My PoE switch is hooked up to a UPS and that’s it, all my PoE cameras now have instant power backup! Simpler, neater and faster installation possible, especially if you are thinking of running Ethernet through your attic or basement. If you are following the EasyDIY approach of just getting an all-inlclusice packaged security camera kit, your cameras will plug straight into the included NVR using the included Ethernet cables. It’s that simple. Read more about these all-in-one packages here. Ethernet switches with Power over Ethernet support are the easiest way to power a PoE camera. 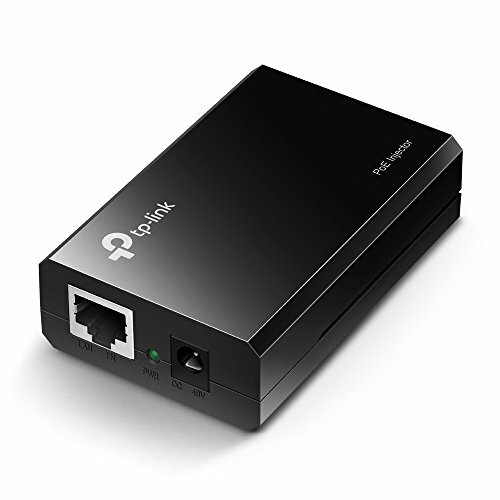 I use a TP-LINK TL-SG1008P gigabit switch with 4 PoE ports to connect my PoE IP cameras. Installation is simple and straight forward – connect the camera to a PoE port on the network switch using a Cat 5/5e/6 Ethernet cable. 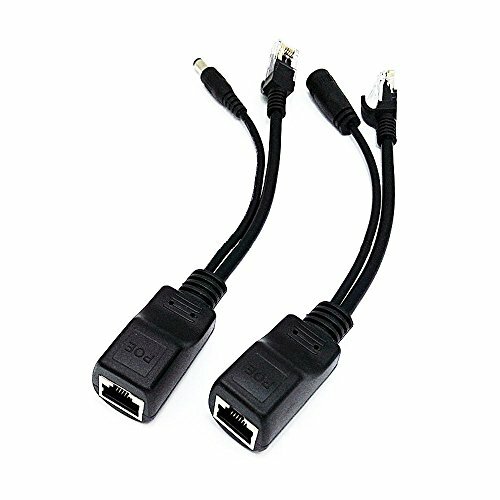 If you are connecting outdoor cameras, use an outdoor and burial rated Ethernet cable. This should last longer and be resistant to critters that like to gnaw away at your cables. Using a PoE injector: These devices are great if you want to use PoE for just one camera and don’t want to buy a PoE network switch OR if you want to use PoE for a non-PoE IP camera. Yes you read that right! You can use PoE even for an older camera that doesn’t support PoE. You have two further options here: a smart PoE injector or a dumb/passive PoE injector/splitter combo. 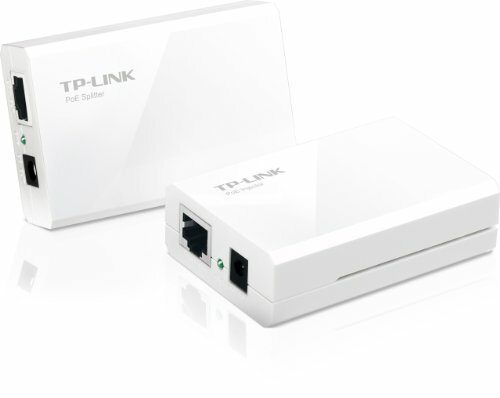 A smart PoE injector includes its own power source and will function just like a PoE switch. It will take your Ethernet cable that carries only data into its input port, and you connect its output port straight to your IP camera. When the camera is powered on, the PoE injector will discover and auto-negotiate the required voltage and power levels for your camera. Smart, isn’t it? A passive PoE injector/splitter combo (or dumb as I call it) can be used for adding PoE capability to a non-PoE camera where you already have a power source. Usually Ethernet cable runs of more than 100 metres or 328 feet are not recommended when you are using it for just data. I recommend the same for PoE Ethernet cable runs because any more than this and you are going to have significant voltage drops which can affect the reliability of your IP cameras. Yes! Just use a passive PoE injector and splitter combo, this way you can use your existing camera power adapter to keep costs down. All major camera manufacturers including Hikvision, Dahua, Axis, Bosch, Vivotek, Sony, Amcrest and Reolink have models that support PoE. Moreover their PoE cameras are always standards-compliant. Ubiquiti is one notable exception – along with stadards-compliant PoE they also have a proprietary passive PoE injection solution that uses a lower voltage of 24V. Be aware of which PoE is supported by a Ubiquiti device before you buy! If you would like to learn more about how I use PoE in my home security camera system, I have written a full guide to my DIY setup. Let me know what you think!